At Prolight + Sound Show 2012, Frankfurt, Germany, JBL Professional launched the STX800 Series portable loudspeakers, designed to bridge the gap between lighter-duty portable PA speakers and full-size tour sound systems. The six STX800 passive loudspeaker models are designed to combine best sound quality with rugged, travel-friendly construction, extreme power handling capability and integration with Crown's VRack amplifier V5 level processing and Harman JBL HiQnet Performance Manager software. 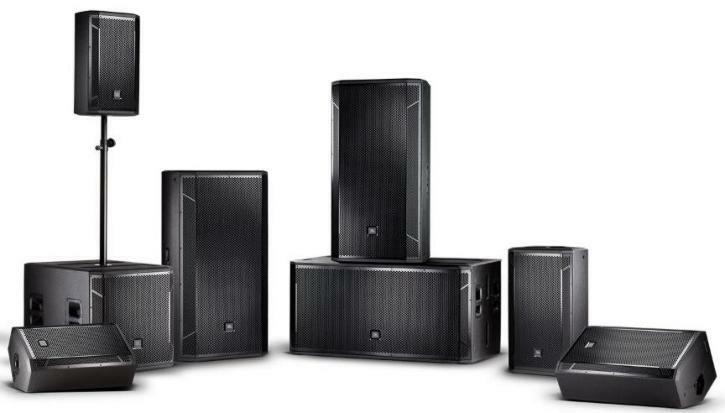 The JBL STX800 Series models include: the 12-inch, 2-way STX812M; the 15-inch, 2-way STX815M; the dual 15-inch, 2-way STX825; the dual 15-inch, slot-loaded 3-way STX835; the 18-inch STX818S subwoofer; and the dual 18-inch STX828S subwoofer. JBL STX800 Series loudspeakers utilize proprietary JBL high-power-handling drivers that deliver extremely low distortion and precision waveguides for accurate pattern control. STX800 Series enclosures are designed for easy handling, durability and are conveniently sized to be truck pack-friendly allowing for the maximum usage of cargo space. "We know that 'performance' encompasses much more than just specs. Total Performance is a design principle we embrace that embodies every characteristic of the product; spectral balance, ergonomics, practicality, extreme power handling, versatility and appearance are all factors that make a substantial difference in the real world of professional audio." said Richard Ruse, Senior Director of Global Sales, JBL Professional. "STX800 speakers are ideal as a simple, high density ground stack sound system and are perfect for regional sound and A/V Rental companies, touring bands and professional mobile DJs. With their M10 suspension points they also function as a cost effective install speaker for night clubs, theaters and churches and are also an affordable, professional extension to a full-size tour sound system when used as side-fills and floor monitors." The STX812M and STX815M can be used either as a floor monitor, on a tri-pod stand or over a subwoofer. Both feature a 70x70 degree waveguide for precise, focused coverage. With its wide frequency range and 90x50-degree coverage angle, the STX825 is ideal for bands or DJs as their primary PA, as a side-fill speaker on a concert stage or as an installed speaker in a dance club or performance venue. JBL's slot-loaded STX835 is intended for full-range use in standalone applications or in high-performance environments as a ground stack passive top box. The STX835 is designed to be placed over the STX828 subwoofer, and its horn-loaded mid and high-frequency 60x40-degree waveguides allow two STX835's to be splayed for wide-angle coverage over a large area. All STX800 loudspeakers can be operated either full-range or bi-amplified. Though compact, the STX818S subwoofer can deliver 1,000 watts of continuous pink noise power handling and comes equipped with a top-mounted M20 pole mount. For applications requiring massive amounts of bass, the STX828S's dual 18-inch drivers handle 2,000 watts of continuous pink noise, 4kW program and 8kW peak. To deliver their standard-setting performance, STX800 Series loudspeakers employ the company’s most advanced technologies, including JBL's CMCD Cone Midrange Compression Driver that provides ultra-low midrange distortion, increased sensitivity, extended bandwidth and improved phase coherence. High frequencies are handled by either a 2432H 3-inch or 2453H 4-inch titanium-diaphragm, neodymium-magnet compression driver, operating in conjunction with JBL’s patented Progressive Transition (PT) waveguides which offer constant directivity and smooth frequency response over a wide area. STX800 Series woofers feature the latest evolution of JBL’s Vented Gap Cooling: Super Vented Gap Technology, which provides more efficient heat dissipation for higher power-handling capability with minimal dynamic compression. JBL STX800 Series loudspeakers offer versatile installation options. All models (except the subwoofers) incorporate M10 suspension points. Optional wheel kits are available for the STX818S and STX828S subwoofers. STX800 Series models are made from top-quality birch/poplar plywood covered in JBL's resilient DuraFlex material, and have road-tough 14-gauge steel grilles lined with acoustically transparent cloth.